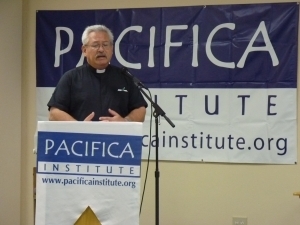 On August 25, 2011 Pacifica Institute invited Father Ron, several Parishioners and some beloved members of The Church of St Luke El Cajon for Fast Breaking (Ramadan Iftar) dinner at Pacifica Institute San Diego Branch. Pacifica Institute Volunteer and Guests had a wonderful conversation while enjoying the dinner. A short presentation given by Salih Esed, Phd about the importance of Fasting and significance of Ramadan. Father Ron made a closing remarks and closing prayer for the evening. Father Ron stated that the importance of engaging each other within Christian- Muslim perspective.